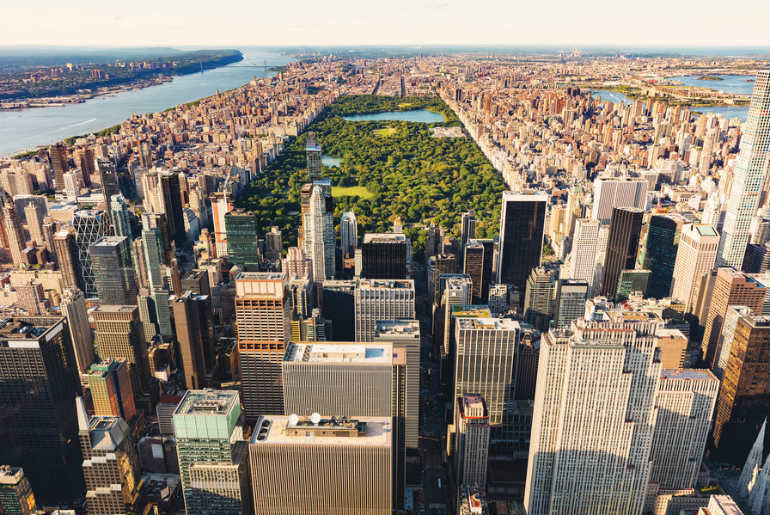 New York Break Guide 2019 Written by Barnaby Taylor. Published on 23rd January, 2019 . New York: the iconic bustling city that never sleeps, The Big Apple, home to some of the most famous landmarks in the world and the bucket list place on most people’s lists. Whether you are flying in for a fleeting business trip or are looking to explore the city with your family, there are a few things that are certainly worth fitting into your trip. 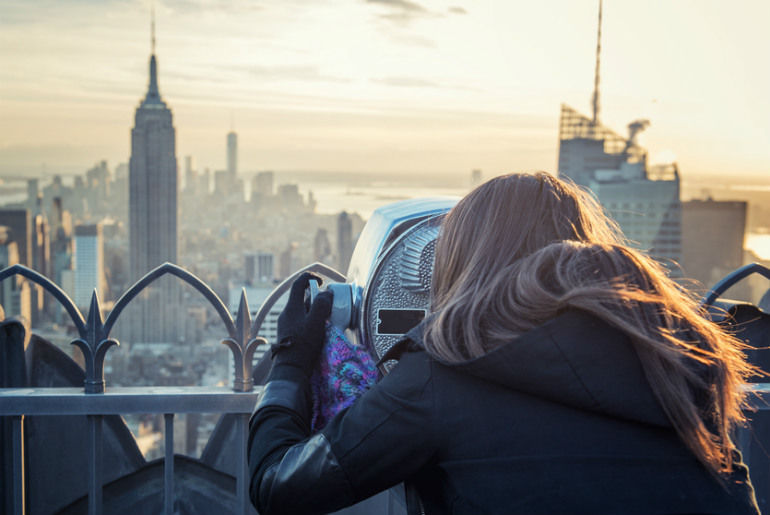 From the delicious food and drink options to the magnificent views to be taken in all over, there really is something for everyone in the vibrant and atmospheric city that is New York. The iconic Manhattan Skyline is the most famous in the world and should not be missed by any New York visitor. You’ve probably seen it in the movies, but nothing quite beats taking in the dramatic backdrop in person. There are lots of places to view the skyline from; admire the sleepless city on a swish rooftop bar with a cocktail in hand or from a serene bench on the Brooklyn Heights Promenade. Fantastic views of the mesmerising silhouette skyline also include the Empire State Building, Brooklyn Bridge, Top of the Rock and One World Trade Center. 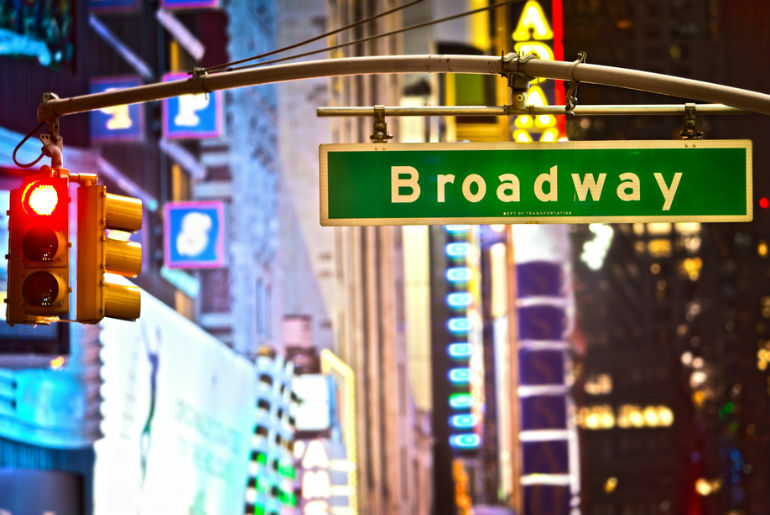 No visit to New York is complete without a visit to the famous Theatre District: the bustling, atmospheric stretch that is home to over 40 professional theatres, staging classical plays to punchy new musicals. A trip to the theatre is the best way to end a day in the city – whether you’ve been at a long business meeting or exploring New York’s delights by foot. Walk down Broadway to experience the millions of glowing lights on billboards and theatre marquees that make this area one of the most famous in the world. One of the most iconic monuments in the world, the Statue of Liberty, is well worth a visit. The statue was a gift from France to the United States in 1886, commemorating the friendship between France and the States during the American Revolution. 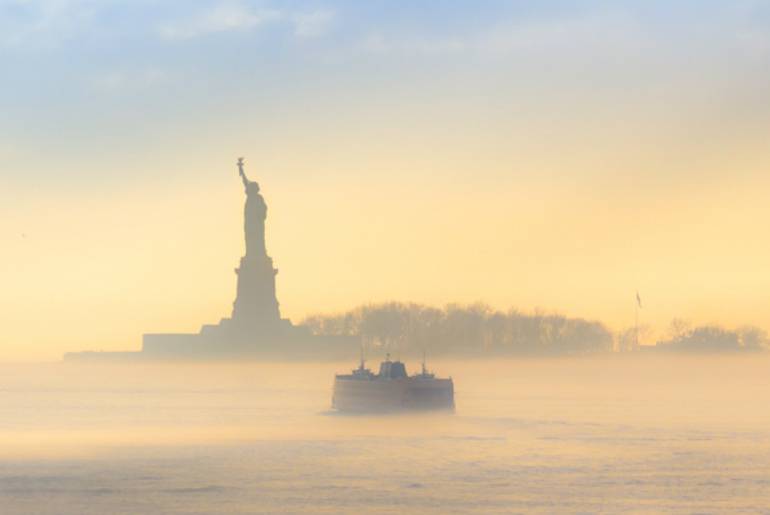 The only way to visit Lady Liberty is by boat: a ride that offers stunning views of the city while allowing travellers to relive the boat ride of immigrants who entered the US via the entrance of Ellis Island, where the inspection station was based from 1892 until 1954. The island also boasts a beautiful Immigration Museum where you can learn all about the first steps that over 12 million immigrants took towards American citizenship. 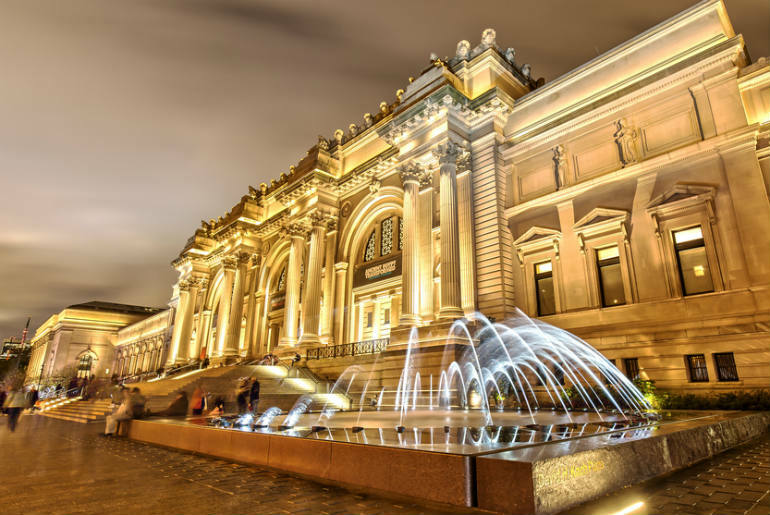 The Metropolitan Museum of Art is one of the finest and largest art museums in the world, boasting over two million works of art that span over five thousand years – from prehistory to present and from all over the world. Each year the museum presents over 30 exhibitions (more than any art museum in the world) that showcase an extensive range of artists, cultures and eras. We particularly recommend viewing the Egyptian art collection – the greatest collection of Egyptian art outside of Cairo. You can expect to find an unrivalled collection of adornments, sculptures and jewellery. The museum is located conveniently on the edge of Central Park on Fifth Avenue in the Upper East Side. The Brooklyn Bridge is just over a mile long, offering some of the best views of the city. The bridge first opened in 1883 and is one of the oldest suspension bridges in the US. 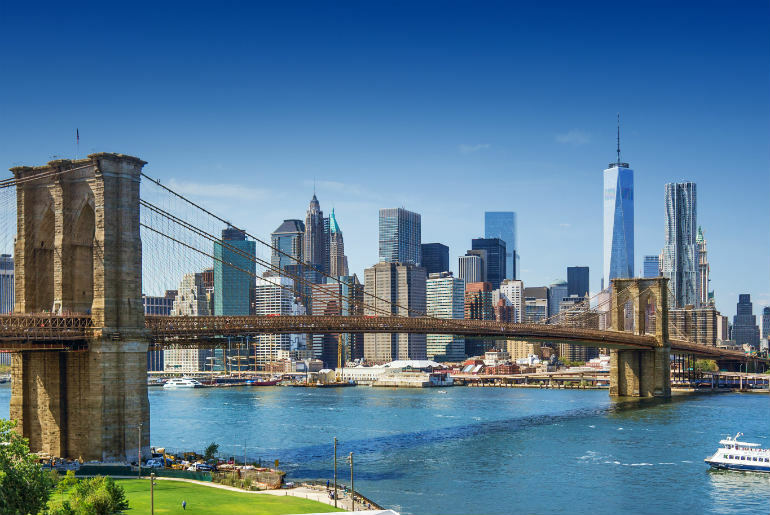 A walk along the famous bridge will give you a sense of freedom as you absorb breathtaking views of New York – and it is the perfect excuse to visit Brooklyn for those famous chicken and waffles, boutiques and craft beer bars. We recommend walking over the bridge in the afternoon and walking back over sunset for a completely different experience of the views and bridge. You can expect a beautiful orange and pink sky and twinkling city lights. 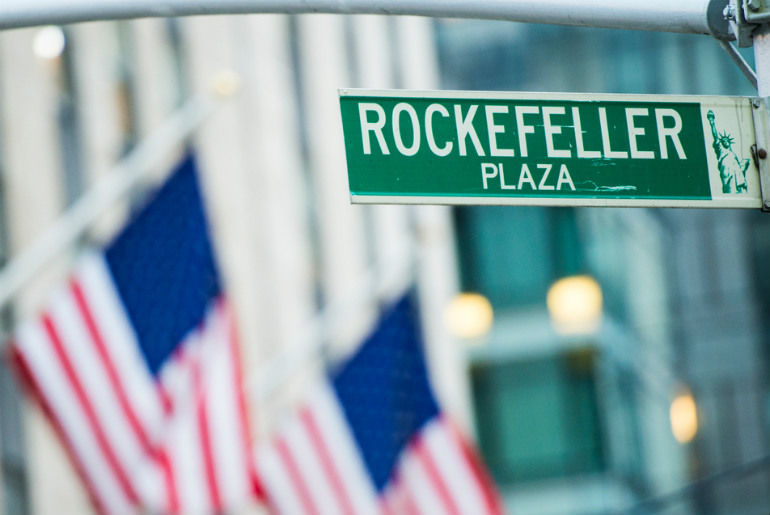 Every trip to New York should be accompanied by a visit to the Rockefeller Centre, located in Midtown Manhattan. There are plenty of things to do here – from outdoor cafes and elegant gardens to shops and, of course, the magnificent view from the Top of the Rock. A guided tour will allow you to dive straight into the artistry and history of New York’s most famous landmark, whereas a tour of Radio City Music Hall will take you backstage of one of the most magical and largest theatres in the world – not to be missed if you’re a performing arts fan! Similarly, you can go behind the scenes of the NBC Studios (home to the studios of iconic shows such as Saturday Night Live and The Tonight Show Starring Jimmy Fallon) for a glimpse of the broadcasting world. A trip to New York will not leave you short of amazing places to eat. Whether you are grabbing a quick bite to eat on the way to a business meeting or are looking for somewhere to sit and mull over delicious dishes, there truly is something for everyone. Below we break down just a couple of foods worth trying during your visit. Breakfast: There is no better way to get your day off to a good start than with a true New York breakfast. Whether you’re opting for chicken and waffles in Brooklyn, American pancakes on the Upper West Side or a classic bagel and coffee in a cafe local to your accommodation, breakfast is not to be missed. 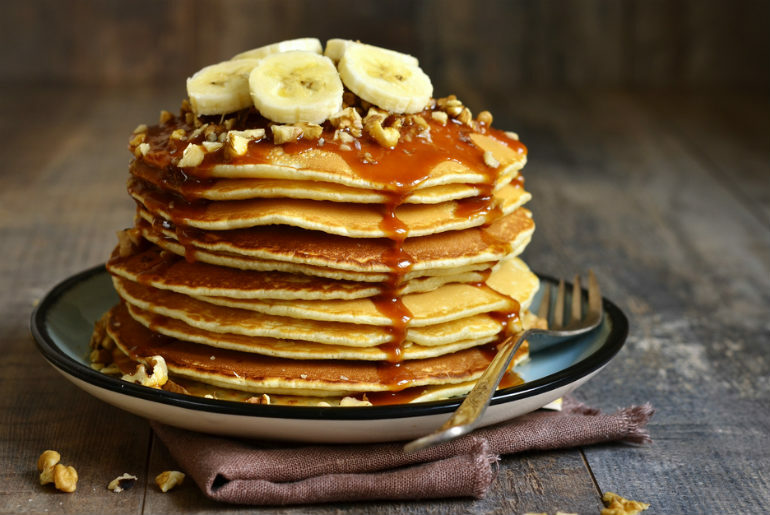 We recommend heading to Bubby’s on Hudson Street for some of the best pancakes and breakfast plates around. Lunch: Step into the shoes of a true New Yorker and head to a deli for lunch. New York City is famous for its delis: they can be found in every neighbourhood and offer all of the essentials; they are, essentially, what bistros are to Paris. Whether you’re stopping by for a hot sandwich, corned beef or some delicious premium sliced meats and cheeses, a traditional New York deli lunch is a must. We recommend Katz’s Delicatessen at 205 Houston Street. Get your trip to The Big Apple off to the best start possible with a British Airways business class flight, guaranteed to leave you feeling refreshed and rejuvenated when you land in New York. Sometimes economy class can get crammed and overcrowded; avoid this entirely with a simple upgrade to a business class flight. 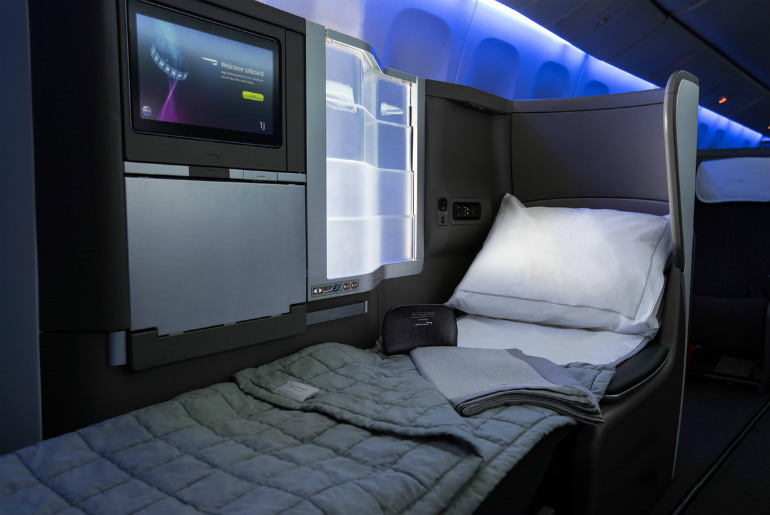 You can expect larger, fully flat beds (perfect for that pre-arrival nap), fine dining, pre-flight entertainment, in-flight privacy and priority boarding – all the components for a stress-free, relaxing flight. At Just Fly Business, we offer a huge range of cheap business class flights, meaning that you can travel to your chosen destinations in style and comfort without breaking the bank. We specialise in discounted and last minute business flights, bringing you the best deals around and ensuring that you receive only the best value for your money. Travelling business class does not need to put you out of pocket, and we make sure of that. Visit our homepage today to begin browsing our wide range of business class flights and holiday deals to New York.